The Digital Inertial Measurement Unit (DIMU) expansion board for AQ6 replaces the AutoQuad6 onboard analog sensors and adds CAN, UART2 and Eeprom memory to AQ6. 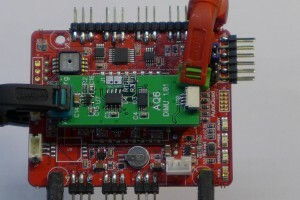 The analog sensors on the V6 are outdated and new and better digital sensors have come out since the V6 board was designed. 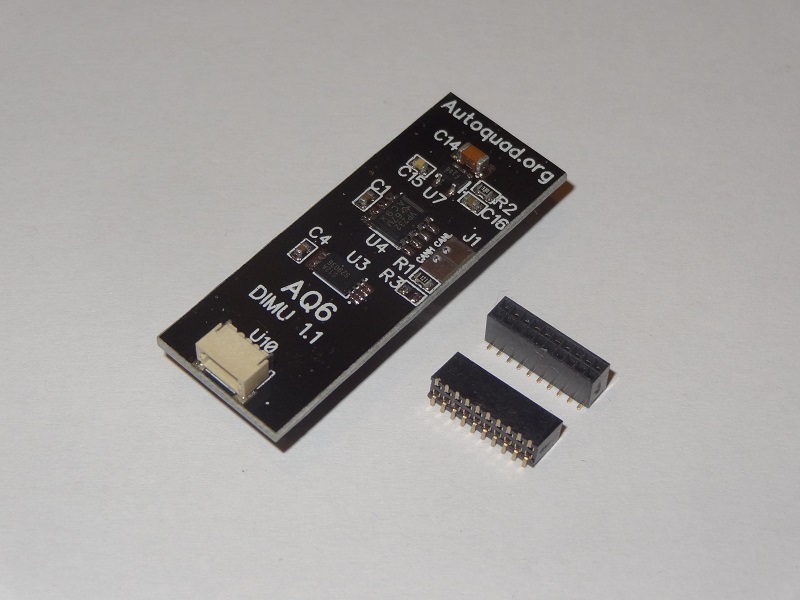 But apart from the outdated analog sensors, the AQ6 board is still fully software compatible with all Autoquad functions, so with a DIMU expansion board, the AQ6 board is fully up to date. Easier calibration: DIMU introduces new onboard calibration methods that allows you to calibrate a DIMU to a flyable state in less than 5 minutes. 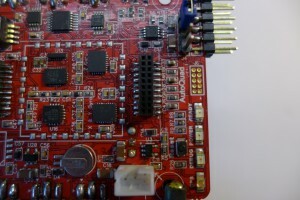 The process is described on the Onboard IMU Calibration page. Better altitude hold: The new digital pressure sensor is much more precise than the old one, giving much better altitude hold without GPS. Not succeptible to magnetic interference in flight: Due to increased gyro stability, Autoquad with DIMU now only uses the magnetometer to estimate initial compass heading on the ground before takeoff. Once you take off, the magnetometer is no longer contributing to the heading estimation. The craft will then maintain steady heading in flight just by using the gyros and accels and correcting with GPS (when available). This means that magnetic interference from power distribution can not affect heading estimation in flight. Mounting the DIMU to the Autoquad board is not very hard if you have basic skills and tools for working with Surface mount soldering. 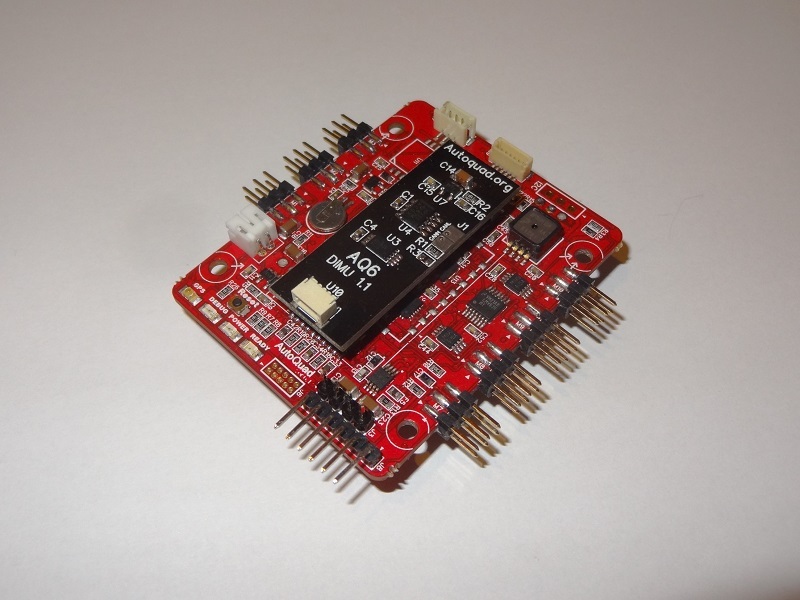 But if you dont feel confident in mounting and soldering small headers, you can send your board into Viacopter and have it upgraded to DIMU for a fee. Send a mail to info(at)viacopter.eu to arrange DIMU upgrade. Clean up the J1 and J2 pads with desoldering braid and alcohol. Line up the female headers with the SMT pads on the AQ6. When board and DIMU lines up, remove the clamp and solder the remaining outside pins and then remove the DIMU carefully from the female headers. Take care and go slow when pulling the DIMU from the female headers – the inside pins are still not soldered. Solder the inside pins of the female headers now attached to your AQ board. Clean up and inspect for shorts or solder bridges. 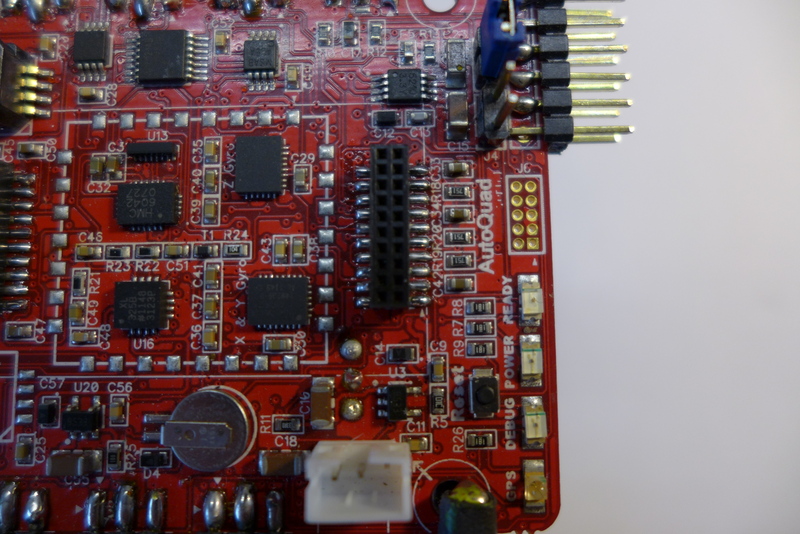 Mount the IMU back in – put a small piece of open cell foam between the AQ6 board and the pressure sensor on the bottom of the board to protect it from gusts. Place the 1.25mm headers on the DIMU board pins. The headers should have angled pins. Using some aid position them carefully on the AutoQuad flightcontroller J1 and J2 pads so that the angled pins are in precise alignment with the pads. If using a clamp as aid to hold it down, please make sure it is just strong enough to hold it, it must not put much pressure on the DIMU daughter board. Tape or just gravity will also work to hold the DIMU daughter board down. Now using small drops of solder paste or solder wire (very thin), tack some pins in place on both the J1 and J2 pads. You should now be able to carefully remove the DIMU and finish soldering all pins to the J1 and J2 pads. 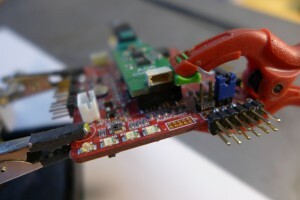 Inspect them with a microscope to see if there are no solder bridges and every pin is connected to the pad. There is no visible indication that the DIMU is working, for that we need to use a firmware that includes the use of the DIMU. NOTE: Like with the pressure sensor on the AIMU, the ones on the DIMUs need to be covered with open cell foam. NOTE: If you can´t use the TARE function like shown in the video you might need to reverse the Pitch. Then it´s Pitch down, Throttle down, Rudder (YAW) left and Roll left (so basically both sticks in lower left corner). The DEBUG led onboard should lit and after a second when you let go of the stick to return to default position the HUD should display a perfectly leveled board. Once you have found a level place to use the TARE function, you should store the parameters in the flash memory of the AQ. Otherwise you´ll need to TARE again each time you repower the board. Saving the values in the EEPROM is currently not working and will be introduced in a later firmware version. This page was created on 8-Dec-13 by menno. Last modified on 17-Oct-14 by kinderkram.